Most people have to fight the battle of the bulge occasionally and restrict their caloric intake with dieting while upping their exercise. Its human nature to overindulge, and too many tasty snacks or large meals can catch up with you quickly, causing your eyes to roll when you step onto the scale. As well as standard calorie counting when dieting and keeping your food intake well below the standard 2,000 calories a day, there are always a number of specialized diets that some refer to as “fad diets.” Many of these diets do work and have their advocates, so they definitely provide the lifestyle and weight-loss benefits those who are on them seek. One thing that all diets have in common, however, is the inability to eat certain kinds of foods. Let’s take a walk down memory lane and remember some popular diets from past decades. They include the Fletcher Diet (an early juicing diet), the Macrobiotic Diet, and Sleeping Diet of the 1960s; the Grapefruit Diet, Cookie Diet (you have to love this one), and Scarsdale Diet of the 1970s; the Cabbage Soup Diet and Beverley Hills Diet of the 1980s; and the low-fat, high-fiber diets of the 1990s like the Ornish Diet. There were several diets that received strong celebrity endorsements, like the Liquid Diet of 1988 (Oprah Winfrey), the Zone Diet of 1995 (Jennifer Aniston), the Jenny Craig Diet (Valerie Bertinelli), and, most recently, the Nutrisystem Diet (Marie Osmond). Some diets have had staying power and been around for a decade—or even several decades—like Weight Watchers (introduced in 1963), and the aforementioned Jenny Craig and Nutrisystem diets. Popular diets of the early 2000s include the Subway Diet (remember Jared?) and Atkins Diet (2003). The Atkins Diet is one of several high-fat and low carbohydrate diets that have been popular over the years and yielded good results for many. The Atkins Diet soon became overshadowed by the South Beach Diet, which was similar but allowed some carb consumption, and the Raw Food Diet and Dukan Diet (2007). Since then, the Special K Diet (2009) Apple Cider Vinegar Diet (2010), Duke Diet (2011), Gluten-Free Diet (2013), Paleo Diet (2014), Goop Detox Diet (2016), Keto Diet (2018), and the Mediterranean Diet, which many people have already deemed the best diet of 2019. Does your head hurt and is your stomach growling yet? That’s an awful lot of diets and just goes to show that people like to diet in a wide variety of ways. There are people who still practice these diets with successful results at reaching their weight-loss goals. The trick is to keep the weight off after losing the desired number of pounds and going off the diet. No Alcohol, But What About Cannabis? One thing that most of the popular diets do not allow is the consumption of alcohol. This is unfortunate, because just when people are doing the best they can with will power, they most likely want a drink that’s off limits. Alcohol, of course, converts to sugar, which equates to calories, and that’s a no-no for dieters. Until the Big Boozer Diet becomes all the rage, alcohol and diets don’t mix. But what about cannabis—is that okay? Fortunately, it turns out that for some diets it is. The extremely popular Keto Diet is one such diet, and there are a plethora of cookbooks and website content that confirm cannabis is A-Okay while on the Keto Diet, which remains extremely popular today. The Keto diet is a high-fat and low carb diet, and as long as those on the diet stick to their acceptable food categories—which does not include alcohol—they should experience success with their dietary goals. Marijuana, of course, does not contain calories or carbs, so it doesn’t impact calorie intake like alcohol. There also is ample evidence that cannabis boosts the metabolism—and that never hurts with weight loss as well. 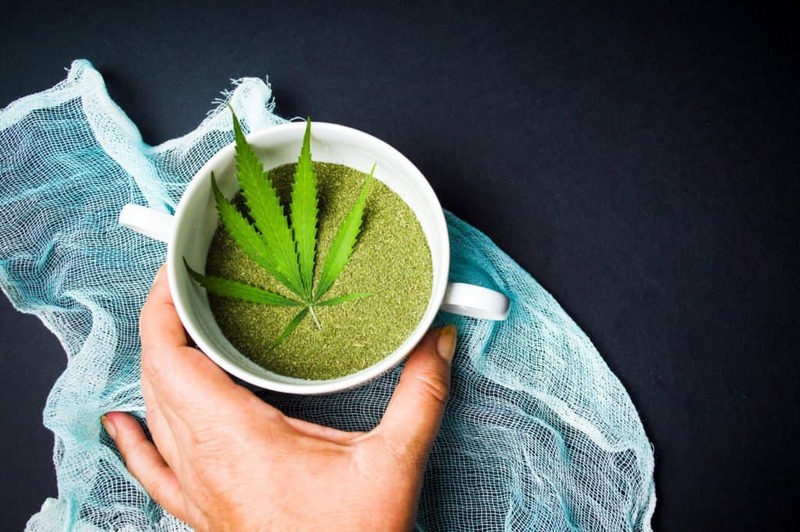 While Keto Dieters everywhere can celebrate the fact that they can enjoy marijuana while on the diet, there is no denying that cannabis use dramatically increases appetite, which is never a good thing while dieting. The appetite stimulation associated with cannabis use can sometimes be very useful for medical reasons, such as for cancer patients on chemotherapy, which decreases hunger. The good news is that all cannabis strains are not created equally when it comes to craving food. Cannabinoids and terpenes play a large role when it comes to developing a serious case of the munchies. Myrcene is a common terpene in cannabis and is also one of the terpenes most associated with appetite stimulation. Strains high in myrcene include Bubba Kush, Mango Kush, White Widow, and many others. In fact, myrcene is considered the most common terpene among all of the various terpenes found in cannabis. Myrcene is also known for being deeply relaxing and a good compound for insomnia. Most people consider sativas to be good for activities that demand high levels of energy, while indica is good for the opposite, low levels of activity. This is one of the reasons why indica is known to induce “couch lock.” Interestingly, studies indicate that cannabis strains containing 0.5 percent myrcene or higher have indica effects, while those containing less than 0.5 percent myrcene induce sativa effects. This indicates that those on the Keto Diet should use sativa strains for recreational purposes rather than indica strains. Although myrcene and some other terpenes are known to boost appetite, they are not the only cannabis compound at play when it comes to appetite. Cannabinoids play a part as well. With our modern understanding of cannabis and cannabinoids, most consumers are familiar with the two big ones, THC and CBD. However, many people do not know that strains high in CBD usually do not boost appetite. Likewise, strains high in THCV—a compound closely related to THC—are known to suppress appetite. Therefore, it stands to reason that people dieting, especially those on the Keto Diet who want to consume cannabis, should try to locate strains low in myrcene, and high in CBD and THCV. The following strains are known as the best for dieters who want to avoid hunger pangs. They either contain high CBD and relatively low THC, low myrcene levels, or high THCV—or combinations of all three of these traits. Fortunately, some are very popular and, as a result, are easy to find. With a breeding background that includes Colombian and Thai, Harlequin leans to the sativa side when it comes to its genetics. The THC-to-CBD ratio CBD tips to the CBD side of the scale, with an average content of 4-7 percent THC and 8-16 percent CBD. An old sativa classic, “Durban” has a strong following among sativa lovers. The fact that it’s also useful for dieting is just one more feather in its proverbial cap. This South African classic has pleasing flavors of earthy dank sweetness. Created by combining Granddaddy Purple with Durban Poison, this strain doesn’t fall far from the Durban tree when it comes to effects. Its pleasing sweet-and-sour cherry flavor results in upbeat and lighthearted effects. This Amsterdam classic was created by Dinafem Seeds and is renown for its high THC content and potent effects. Its White Widow and Haze parents result in a balanced euphoria and piney sweet flavors. This special strain is great for those wishing to curb their appetites. A product of Resin Seeds in Spain, Cannatonic boasts high CBD levels (16 percent plus) with relatively low THC (rarely exceeding 6 percent). The CBD content provides mellow relaxation but Cannatonic’s low THC makes it highly functional. These strain recommendations barely scratch the surface when it comes to strains that are helpful for dieting. With additional research, you will be able to identify many more. It does make a good starting point, though, because each of these strains maintains a high level of popularity that makes them available in dispensaries. Keep your eye out for them when visiting dispensaries of you are on a diet. Using one or more of these strains may help you reach your target weight. Good luck locating some of them—and good luck with your diet. You’ve got this!